Egyptian security forces have intercepted a number of Grad rockets being smuggled from the Gaza Strip through cross-border tunnels into Egypt’s Sinai, MENA reported on Friday. 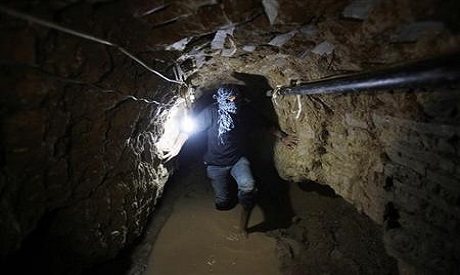 Security forces thwarted the smuggling of 20 rockets and launching bases when they clashed with Egyptian and Palestinian Islamist militants at the opening of one of the tunnels in Egypt's border city of Rafah, security sources told the state news agency. Around one hundred people have been killed in Gaza by Israeli airstrikes over the last four days, in what Israeli officials says is a response to Palestinian rocket fire. The sources said that the militants were planning to use the weaponry to fire at Israel or against Egypt's security forces in Sinai, where the military is fighting an Islamist insurgency. Since early 2013, Egypt's military has intensified a campaign against cross-border smuggling tunnels between its volatile Sinai Peninsula and the Gaza Strip, saying they are used by militants on both sides to smuggle fighters and weapons. Egypt's government accuses Hamas, the dominant force in Gaza, of aiding Islamist militants at home--charges the Islamist group denies. The closure of most of the hundreds of passages, used to smuggle goods into the Palestinian enclave, has led to acute fuel shortages and steep hike in prices. They must be afraid Israel will find them. i hope Egypt will keep them. Peace Agreement say Israel. Good luck fellas. LOL. May Allah (SWT) bless Sadat soul.